Life > > What is global change? "My view of the overall global change issues is that there are a set of global changes of which we're certain that are caused directly by human activity..."
What is global change? Global change describes major alterations to Earth, such as warming of the Earth's climate. Climate change, however, is not the only possible form of a global change: other examples can extend to biodiversity loss, changes in the water cycle or nutrient cycles, alterations of landscapes, and more. In this clip from the 1994 presentation "Biological Invasion Overview," Peter Vitousek offers a list of the different categories he uses when considering global change. He points out that some of the changes are more certain than others and some have been directly related to human actions. Dr. Peter Vitousek is an ecologist and professor at Stanford University, where he has been faculty since 1984. He has a PhD in biology and focuses primarily on nitrogen and phosphorus enrichment in soils and the impact of invasive species. He is a Senior Fellow of the Woods Institute for the Environment. Dr. Vitousek began college as a Political Science Major but was inspired to change the focus of his studies after reading aCharles Elton book about ecology for an English class. Dr. Vitousek was born in Hawaii and continues to conduct field work there periodically. 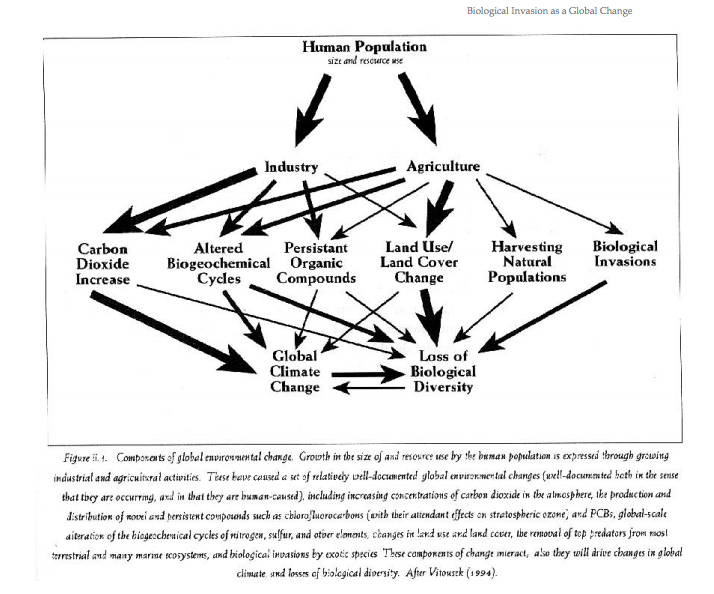 A summary of his talk on invasive species and global change is available on the AGCI website in the Elements of Change Series, Biological Invasion as an Element of Change, pages 65-67. What are some of the categories of global change listed by Dr. Vitousek? Are there any alterations that Dr. Vitousek lists which you think do not belong in the category of global change? Why or why not? Are there any alterations (human caused or natural) that Dr. Vitousek does NOT list which you believe qualify as a global change? Take a look at Dr. Vitousek's diagram. Select one of the arrows showing a relationship between a human activity and an example of global change. Make a list of ways that humans could change their behavior to either increase their impact (make the arrow thicker) or diminish their impact (make the arrow thinner). There is not yet a Go Beyond activity for this clip.